Sunday I had the pleasure of hiking the first stretch of the Pinhoti Trail, Alabama's connection to the Appalachian Trail. It starts on Flagg Mountain, the southernmost mountain in the Appalachian chain that rises 1,000 feet above prevailing terrain. This wooded corridor is preserved by the state's Forever Wild program, and it's a fabulous trail that descends into a wooded valley, cupped by low mountains. At the base of the valley is lovely Weogufka Creek. There's a trail shelter by the creek. I almost hate to spread the word because this spot isn't widely known and part of me wants to keep it to myself. Another Flagg Mountain hike, featuring the abandoned CCC-built stone fire tower atop Flagg Mountain is included in my book, Five Star Trails: Birmingham. 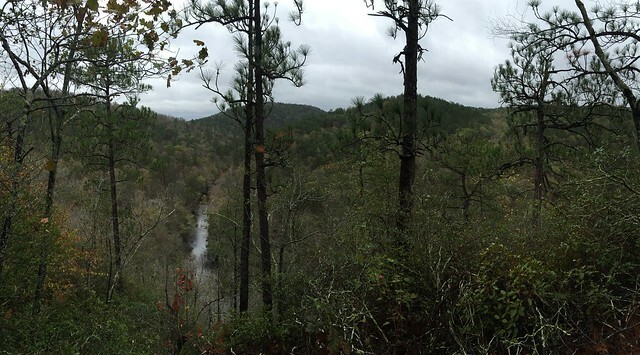 There is additional information about that hike at the Alabama Hiking Trails Society website. The map of this Pinhoti stretch can be found here. And you can find additional information, instructions, and directions on the hike at the Pinhoti Trail Alliance website. One thing I'll mention. The trail from the Flagg Mountain trailhead to County Road 56 is 5.3 miles. The section from the trailhead to the creek (about 2.5 miles in) and beyond is very well-marked. However, when you reach a clearcut area, you might find it difficult to stay on the trail. I got off it and had to bushwack. If I had to do it over, I'd just go out and back. The best scenery is in that first 2.5 miles.